ENJOY EXERCISING, LOOKING FORWARD TO IT, PLANNING FOR IT, AND EVEN DARE I SAY . . . CRAVE IT! Do you hate to exercise and have to drag yourself to the gym (or don’t make it there at all?) Do you dread it or just put it off for weeks which turns into months which can even turn into years (yikes!)? I felt the same way for many, many years and would look at my friends who did love to exercise with envy. What did they have that I didn’t? Why was it so enjoyable for them? Why did they run off to the gym, a spinning class, or an exercise class like it was a huge treat? Then I discovered that hypnosis changes your brain patterns and habits into ones you love. 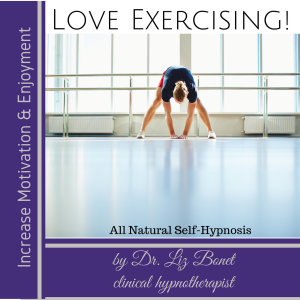 If you want to Love to Exercise, this is the hypnosis file for you! What a wonderful feeling it will be to enjoy exercising! That can all be accomplished with regular listening to “Enjoy Exercising” by Dr. Liz. Based on surveying actual people’s real reasons for wanting to exercise and interviews with people who love to exercise! What motivates them? What makes them do it? What makes them love exercising? Dr. Liz found out and then crafted a hypnosis to help you feel the same way about exercising. For daytime: You can listen to the hypnosis to Love to Exercise during the day. If you play it during the day, you will be easily able to go about your day at the end of it. For nighttime: I often recommend that you put the hypnosis on while you fall asleep, face down (so the light does not mess up your sleep patterns), and let the file play. There is a suggestion at the end that if you need to stay asleep, you will sleep well the whole night, only waking up if you need to; otherwise waking up rested and energized for the day ahead. 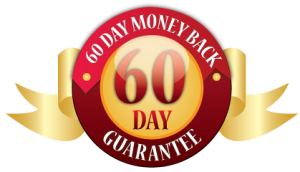 How many days: I recommend listening to the Hypnosis to Love Exercising daily for 30 days. Most people start to notice changes within the first days, but we want those neural pathways laid down really well! After 30 days, you can listen to it at your leisure and/or whenever needed for a boost of motivation.